I am just beginning the writing stage of my project on Southern Tourism and Arlington House for a book of essays that is being edited by Karen Cox. The research is fascinating and I am learning quite a bit about the history of how both the home and the surrounding landscape have been interpreted. I am interested specifically in the evolution and challenges associated with interpreting Lee’s decision to resign his commission in the United States Army within a broader “sacred” landscape that is dedicated to remembering those who gave their lives for this country. The essay also touches on the challenges associated with Lee, slavery, and the Lost Cause. 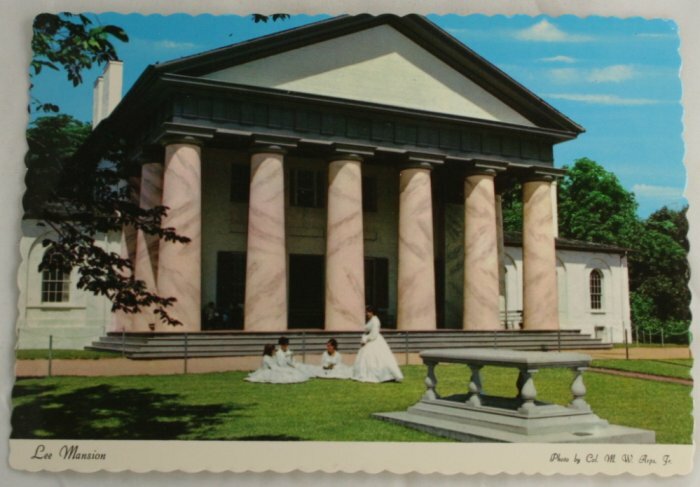 Here is an interesting postcard of Arlington House that I came across, which dates to the 1960s. It is one place I must visit before I get too crippled up to go. ISTM that Arlington House should be about GWP Custis, and only incidentally about RE Lee, but I guess that is expecting too much. Love the postcard! A potential image for the publication! Previous post: In Defense of Our Freedom?